Posted 4/22/2014 10:27am by Josie Hart-Genter. Posted 4/17/2014 11:09am by Josie Hart-Genter. Enjoying Colorado fruit in-season is one of life’s simple pleasures. Ela Family Farms looks forward to sharing our fruit harvest with you through the Denver Botanic Garden CSA share. Our fruit share offers 80 lbs of organic fruit over 12 weeks and suits a family of 2-4. We let our fruit ripen on the tree a little longer, striving to bring you the best tasting fruit you will enjoy all season! As you know, Mother Nature is ultimately in charge. If we have a crop loss or shortage, we will substitute the full retail value of the fruit with our organic artisan fruit products or another fruit. We guarantee our fruit and that CSA members receive the full retail value of their share. Oct. 28&30- 20 lb. box of storage apples. When kept cold, these apples will be delicious for weeks. To purchase a fruit share, please visit our the www.chatfieldcsa.org homepage and update your account. Posted 4/14/2014 6:24pm by Josie Hart. Modern Gingham Jam Share - Support a local Denver mom and fellow CSA shareholder! The 2014 jam share will include at least six 8 oz jars of jams made from locally harvested fruit and vegetables made into unique flavorful jams. Modern Gingham Preserves is a Denver-based preserve company that uses locally grown (and often locally foraged including Chatfield) fruits, vegetables and herbs to make unique, fruit forward, softly set jams. Flavors of the jams will be dependent on what the local harvest season produces. Flavors may include Palisade peach jam, local raspberry and mint jam, hot pepper jam, or flavors yet to be developed based on what the season brings us here in Colorado. These shares will contain several unique jams only available to CSA members. Distribution will take place in October. You can purchase a share from the link below! Welcome to the 2014 Chatfield CSA Program! Posted 4/11/2014 3:02pm by Josie Hart. If you still have an accounting question or want to change something within your account, please contact josie.hart@botanicgardens.org as soon as possible. - CSA Volunteer Orientation: May 3, 10 a.m. - 12 p.m.. It is not too late to become a volunteer. We have weekly volunteer opportunities every Tuesday, Thursday, Saturday and Sunday, from 7 - 10 a.m.
- Our growing season has been blessed (we hope) with an early spring and there are already a few making progress. If we don't get snow in May, we will have our first Supporting Share distribution on May 13 at York St. and May 15 at Chatfield. At this point these dates are tentative and depend on the mid-spring weather. - For all shareholders the tentative date for the first full distribution is May 27 at York St. location and May 29 at Chatfield. Both locations will be open for share pick up from 4 - 7p.m., weekly. Fruit and egg shares will not start until later in the season. Details and prices of the meat share and jam share will be confirmed soon. - This year, we will be selling local mushrooms and cheese at both distributions but we are not offering a full share for an entire season. - We will be sending out egg and fruit share information to all shareholders becuase we still have both of these shares for sale if you want to buy one online. - Please join us for our annual Open House event on June 7, 1-3 p.m. for food, tours, a chance to meet the CSA team and an overview of our new outreach partners and programs. There will be barrel rides for the kids and other fun things so bring the whole family! The first flush of asparagus has already appeared, but was zapped by the cold nights last week. We’ll have a couple bigger flushes coming, with the timing dependent on the weather. We’ve overwintered some crops such as carrots and spinach and surprisingly cilantro! We’re seeding cover crops now, getting fields plowed and equipment prepped and the first planting of beets just sprouted. Carrots have been seeded and we are working on additional asparagus plantings this week. Things are looking good! The weekly newsletter will start in May, filled with useful information on our CSA program, notes from the field, recipes and other highlights. Hope to see you all for our Open House Event down at the farm! Chatfield CSA shares available for purchase! Posted 2/4/2014 4:40pm by Josie Hart. We would like to extend an invitation to purchase a CSA share. We have just under 100 full and supporting shares left after renewals. We also offer a fruit share from Ela Farms and an egg share from Eastern Plains Natural Food Coop. Additionally, there will be a cheese and meat share available later in the season. We are very excited about our 2014 season! We are extending our CSA to include a portable farm stand that will sell produce to low-income families in food deserts, classes and workshops for CSA members, foodie gatherings, a farm to fork dinner, volunteer opportuntities and of course great local produce. Make sure to use your main email when registering so we can easily contact you. If you would like to add anyone to your account who may be helping with pick up or covering for you while you are away, you can do so after your account is set up. Please note that we have a $5 credit card processing fee. If you need to utilize our payment plan, you can set up a schedule that will charge your card at the begininng of each month until your total is entirely paid. We appreciate your support of the Chatfield CSA and look foward to sharing a season of local produce with you! Posted 1/23/2014 11:48am by Josie Hart. Thanks to all who have already purchased a 2014 share! Everyone else, remember to sign up by February 3, before the waitlist is opened and unclaimed shares are released. We have over 200 people on the wait list and only 100 extra shares. We are ordering seeds and supplies and it is very helpful to know we have a secure amount of money to work with. We appreciate the people who brought leaves to the farm last fall. They are a great source of carbon, which is crucial to maintaining a healthy compost system. We just finished spreading compost on the fields, including compost generated at the farm. In the coming season, we aim to use up to 100% on-farm compost to reduce the use of transportation diesel fuel emissions. Almost all crops are gone from the fields, except for some overwintering spinach and experimental carrot beds. We purchased a giant roll of greenhouse plastic to construct low-tunnels, which will help us extend the harvest season into November. As I am putting the finishing touches on the crop plan, we are keeping in mind the anticipated Thanksgiving pickup of storage crops, greens and herbs. I’d like to thank those who have already purchased a Supporting Share. These are crucial to support our efforts to expand access to fresh and healthy produce. The Supporting Share also helps fund our Veteran Reintegration Program, which combines a therapeutic approach with job-skills training in areas throughout the Chatfield site. We will also keep donating produce to aid groups in food deserts such as the Grow Haus and Mo’ Betta Greens. Through purchasing an egg/meat share or fruit share you are supporting our local farm partners such as Ela Farms and the Eastern Plains Natural Food Co-op. The same is true if you purchase a jam share from your fellow CSA member Kathy’s Modern Gingham jam company. I’m also proud to announce that, as I type this, I am looking at our brand-new SNAP program permit. We will now be able to accept Electronic Benefit Cards for people on Federal Food Assistance programs at our new Denver Human Services’ farm stand. We will be offering discount produce and accept EBT cards in one of this city’s biggest food deserts. We can’t continue to engage and serve our community with these fresh food initiatives without your help. We ask that you consider buying a tax-deductible ($325) supporting share. We still have 20 available shares, so please read over the online information if you would like to learn about additional benefits, including a gourmet farm-to-table dinner at Chatfield! Posted 12/30/2013 10:54am by Josie Hart. The Chatfield Community Supporting Agriculture (CSA) provides a season of sustainably grown produce from mid-June through late October. The Gardens CSA is unique because we offer a market-style distribution which allows shareholders to select their own produce. The distribution process varies depending on the amount of weekly produce, but takes at least 10 minutes. There are two distribution sites to pick up shares: Denver Botanic Gardens at York Street on Tuesdays from 4-7 p.m. and Denver Botanic Gardens at Chatfield in Littleton on Thursdays from 4-7 p.m.
You can purchase your shares online starting (for yourself or as gifts) Jan. 6, Monday at 8a.m. You will need your email from last year in order to purchase a share. Please click on this link http://www.chatfieldcsa.org/login or visit our homepage to get started. In 2014, the Chatfield CSA will offer one share size. The previous large and small shares have been combined to create one share that feeds approximately 3-4 people. Please visit the CSA page on our website for a list of typical produce that is distributed. The full-season vegetable share lasts approximately 23 weeks and the season has been extended by 2 weeks. A new fall pick up with Thanksgiving food items has also been added to include herbs, winter squash and root vegetables. This share size is larger than 2013’s small (2-3 person) share. Shareholders now have the opportunity to sponsor CSA outreach efforts. Supporting Shares will enable the Chatfield CSA to continue and expand efforts to increase healthy food access to low-income families. The cost of this share includes the $475 full share plus $325 to sponsor outreach projects. *All Supporting Shares are partially tax-deductible and letter of donation will be provided. Enjoy a Longer Season: The Supporting Share produce season will begin earlier in June with lettuces and greens and extend through the fall Thanksgiving pickups. Receive Specialty Produce: In addition to receiving the full share, specialty items such as asparagus from the farm will be distributed. Farm to Fork Dinner: Invitation to a complimentary special dinner event with a cocktail hour, farm tour and candlelight dinner. New Chatfield CSA Farm Stand at Denver Human Services: Families that receive federal food assistance can become part of our community and use Electronic Benefit Cards at the farm stand to purchase fresh, discounted CSA produce. For more information, visit the CSA website. Denver Botanic Gardens Urban Agricultural Initiative: The CSA will continue to donate produce and programming support to Mo’ Betta Greens Marketplace in the Five Points neighborhood, local food banks, Denver Housing Authority and Cooking Matters. Since the 2010 start of the Chatfield CSA, we have donated more than 10,000 pounds of produce to local organizations! The Veteran Reintegration Program: Launched in 2013 as a collaboration between the Chatfield CSA and Gardens’ horticulture staff, the program provides a therapeutic farming experience as well as paid CSA positions to veterans. The program focuses on helping veterans reintegrate into society and learn a new skill. To learn more about Chatfield’s Veteran Reintegration Program, visit our website. 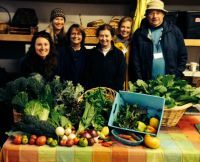 The Chatfield CSA also offers a limited number of Volunteer Shares. This share provides a $160 discount in exchange for 60 hours of volunteering throughout the growing season (May – October). Volunteer shareholders are a very important part of our program. Please email csa.chatfield@botanicgardens.org for more information and to set up an interview with CSA staff. To make payment more manageable, we provide an optional payment plan to split the cost into equal payments. For example: If you purchase the share in February, you have five months to pay in full, so monthly payments will be $95 (full share) or $160 (supporting share). We are offering two additional shares this year. Shareholders are required to purchase a vegetable share in order to take advantage of additional shares. Each share will be a 20-week commitment, with upfront payment required. Organic Fruit: $200! For renewing members only. We are offering a limited number of fruit shares at this price to show appreciation to our shareholders! The fruit share begins the second week of August and includes approximately 11 weeks of local organic fruit (provided by Ela Family farms in Hotchkiss, CO). Fruit includes pre-bagged organic peaches, plums, pears, apples and cider. Heritage Organic Meats: Price TBD - This one-time share features a variety of organic chicken, turkey or beef. Details and purchase information will be sent out at a later date. Local Free Range Eggs: $115 Eggs are provided by Eastern Plains Natural Food Co-op, a long-standing organization that supports Colorado small-scale egg producers. All eggs are raised with humane, free-range practices with natural or organic grain feed. Local Organic Mushrooms: One, half-pound bag of mixed mushrooms may be purchased each week. The mushrooms are grown by Hazel Dell Farm located in Fort Collins, CO. Shitake and cremini are the primary mushrooms, along with the occasional oyster, Lion's Mane and portabella mushrooms. Chatfield Honey: Local honey from the Chatfield farm is sold. Shareholders are welcome to visit the bee hives at any time. Fresh Cut Flower Bouquets: All flowers are sustainably grown at Chatfield. Additional products like local cheeses will be be for sale weekly as well - more information to follow. Local, seasonal artisan products available for individual purchase. Invitations to CSA shareholder events and community activities. Discounts on the CSA Education Series that includes classes on canning/preserving and children’s programs held at Chatfield during the growing season. Posted 12/23/2013 3:34pm by Josie Hart. You can purchase your shares online starting (for yourself or as gifts) Jan. 2, thursday at 8a.m. You will need your email from last year in order to purchase a share. Please go to our homepage and click on this link http://www.chatfieldcsa.org/login or visit our homepage to get started. We are offering two - three additional shares this year. Shareholders are required to purchase a vegetable share in order to take advantage of additional shares. Each share will be a 20-week commitment, with upfront payment required. Additional products like local cheeses will be be for sale as well - more information to follow. Posted 12/6/2013 11:38am by Josie Hart. As a CSA Shareholder, your feedback is greatly valued and helps improve and grow the program. We appreciate you taking five minutes to complete the 2013 CSA Shareholder Survey PDF, save your changes and email it to csa.chatfield@botanicgardens.org. Also, we will be sending the 2014 share prices and purchase information this month. Shares will be available for online purchase in January. As current shareholders, you can purchase a share for someone as a holiday gift. Please email us and we will issue a gift certificate before you purchase in January. Posted 11/7/2013 12:34pm by Josie Hart. Those of you who need to pick up your last storage box of apples (Chatfield members only), please come to the farm today during normal distribution times and our staff will assist you. We will be here from 4-7 p.m.
We also will have some honey that we still haven't sold if you are interested - ($10 jars and small gift jars for $5). Please join us this Saturday from 2-4p.m. to gather with your CSA friends and share some yummy food. We will be in the Green Farm Barn, so feel free to stroll around and come to eat at 2 p.m. Beyond the dish I am making, I will have salad greens for everyone to enjoy from the field!